It replicates the taste, texture and smell of beef without harming a single cow. Every October, two vegetarian friends of mine from Michigan spend a week at my place while they attend New York Comic Con. Because I take my hosting duties very seriously, I always try to find good places for them to eat here in New York. It's not too hard, as you can find vegetarian and vegan restaurants for pretty much every major cuisine here. But one thing that I haven't been able to locate is a good meat substitute. That changed last week when a restaurant here in the city became the first and (so far) only location to offer the Impossible Burger, a lab-developed patty that claims to replicate the taste and texture of real beef using the similar proteins found in plants. I dropped by for lunch to test this assertion -- and to scope it out for my friends, of course. The Impossible Burger was created out of a desire for more environmentally friendly food production. You see, it takes a lot of resources to raise animals for consumption. That includes obvious assets like land and water but also the fuel needed to run the various machines that make farming possible. You can produce a lot more food from a crop of wheat than you can from a herd of cattle. However, it's hard to shake the habit of eating meat; it's such a big part of various cultures' cuisines, and it just tastes good. Meat substitutes have arisen to try and bridge that gap and, though products like tofu and seitan can function as a protein in many dishes, they just don't impart the same amount of oomph as red meat or poultry. 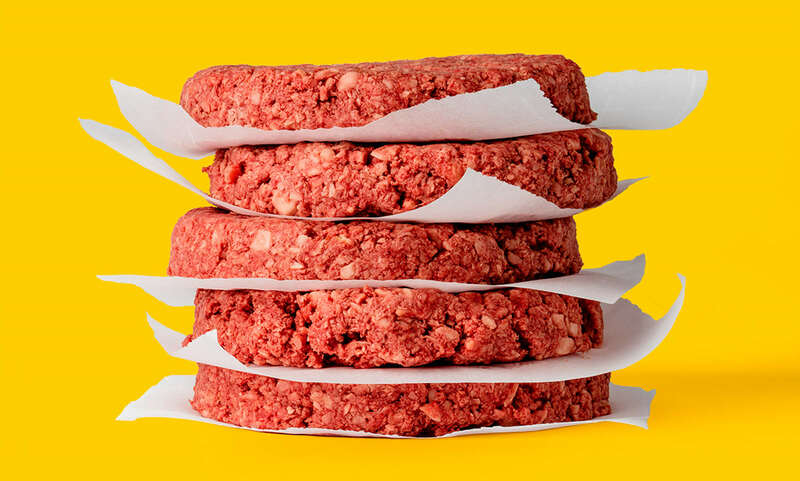 The team at Impossible Foods spent five years in a lab trying to unlock that secret, studying every facet of the burger experience including its look, smell and taste. Eventually they were able to isolate heme protein as the root of the meat's flavor. It's abundant in animal flesh -- the word comes from the Greek for 'blood' -- but it also occurs in plant matter as well. Plant heme protein makes up less than 2 percent of the Impossible Burger, but it's a vital 2 percent. What makes up the rest of it, nailing down other essentials such as smell and texture? Protein from wheat and potatoes, coconut oil and various vitamins. Apologies to Celiac sufferers and other non-gluten-eating people: Even without its bun, the Impossible Burger isn't gluten-free. It also contains some soy protein, a common allergen. Happily for my tree nut and peanut allergies, those ingredients are absent here. The Impossible Burger is currently being served at Momofuku Nishi, the newest of chef David Chang's "New Asian" family of restaurants. Most of the menu consists of traditional Asian dishes like kimchi and ramen, so the $12 Impossible Burger stands out -- it's listed under "buns & noodles," as there's no other place to put it. According to Impossible Foods' spokesperson Lance Ignon, Chang was chosen for this initial run of the burger due to being "one of America's most respected, innovative and creative chefs." The values that govern Momofuku also mesh well with Impossible Foods' own, most notably the chain's support for sustainable, responsible food sourcing. While waiting outside for the restaurant to to open, I heard various other diners describe the product as "a new vegan burger" or "new fake meat," neither of which really imparts the full depth of the accomplishment. Additionally, Ignon wants this to be absolutely clear: "We don't make imitation meats. We make meat from plants." I didn't have to wait long to find out how true this was, as my friend and I got our food about 10 minutes after placing our order at the bar. That's a fairly standard wait for a burger, which makes sense because the plant-based beef cooks just like cow meat, starting out pink and slowly browning on the griddle. Each burger came on a metal tray with a side of thin fries and a little cup of ketchup. The fries were fairly standard, and I only munched on a few. As for the burger, it came on a soft potato bun topped with a fairly standard complement of lettuce, tomatoes and dill pickles. 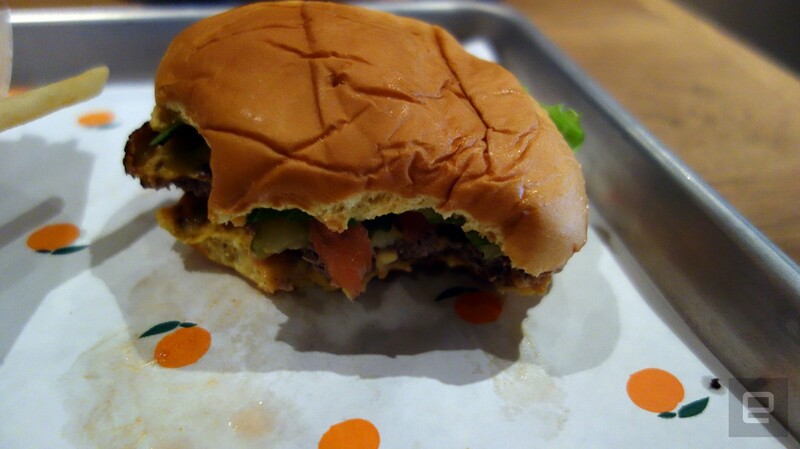 The bottom of the patty is slathered with a good helping of "special sauce." 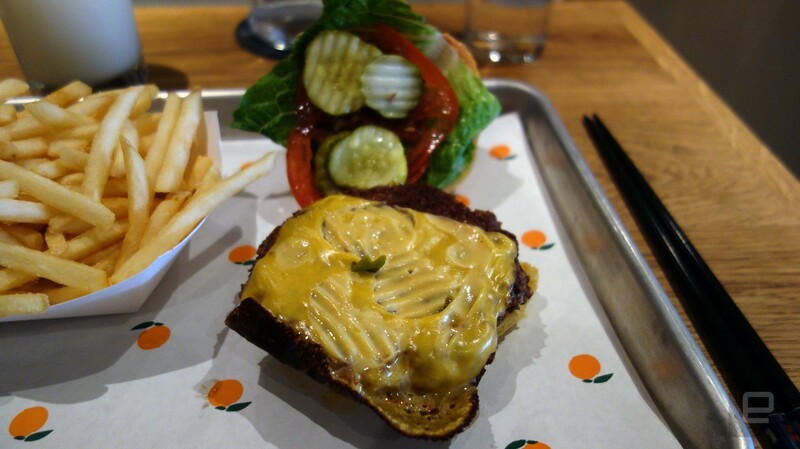 The Impossible Burger can be ordered with cheese as well, though you need to specify if you want the vegan option. I opted for regular cheese: Not just because I like the taste of dairy, but because vegan cheese tends to use nuts like cashews and almonds so I can't eat it. At first blush the Impossible Burger looked like a regular burger. There was one small annoyance in my particular helping: Some of the cheese appeared to have burned on the grill, leaving a crispy wafer sticking out from the side. After poking and prodding at my food for a bit, I finally took a bite of the burger. There was some initial weirdness with the texture -- a bit of extra chewiness that surprised me because, to all my other senses, this was a piece of beef. So I can't say with total confidence that it's completely indistinguishable from cow flesh. However, if you were to give it to someone without revealing that it's plant-based, there's a good chance they'd never know (unless they are allergic to soy or have sensitivity to wheat, so don't do a blind taste test without checking first). I admit it was hard to stop and take photos, because it was delicious and all I really wanted to do was stuff it in my face. 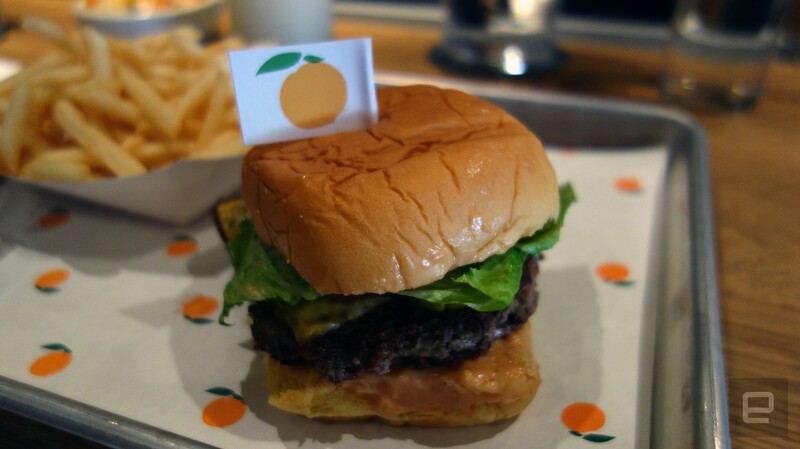 The nice thing is that Momofuku Nishi didn't dress up the Impossible Burger in any particular special way, so you aren't judging it based on its dressings. 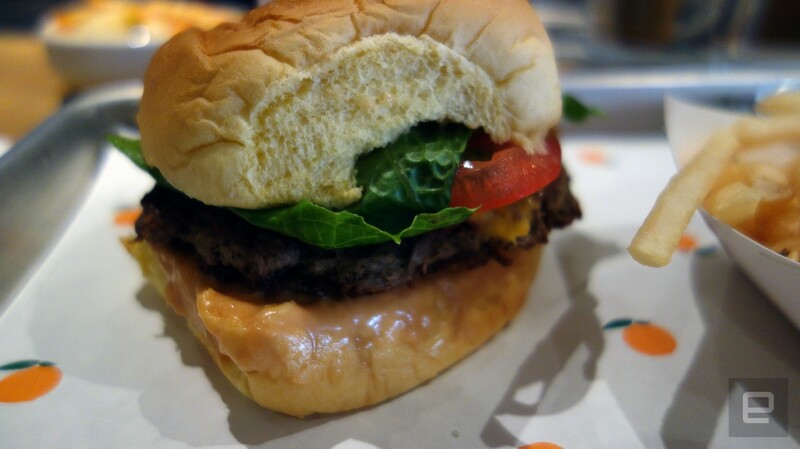 The simple toppings made it taste akin to some of my favorite burgers in the city, like Petey's in Queens or Five Guys. The one thing missing from the Impossible Burger is fat. It's generally acknowledged as the ingredient that makes meat taste good, but the burger seemed to be doing just fine there thanks to the plant heme. However, researchers at Purdue University have postulated that there might a sixth taste besides sweet, salty, sour, bitter and umami called "oleogustus," which means "oily taste." And that was definitely absent from the Impossible Burger though that wasn't a dealbreaker for me. You see, usually after eating a burger I feel kind of greasy and overstuffed; I usually crave a long walk and a good shower. I decided to walk back to the Engadget office for that exact reason, only to realize after a block or two that I felt fine. For some the absence of the fat might be a negative, but it was a huge positive for me because I don't enjoy feeling gross because of something I ate. Momofuku Nishi's price of $12 is a bit high compared to something like Five Guys, but that's more because of where you're eating than what: It's actually one of the lower-priced items on the restaurant's menu. (For contrast, a Shake Shack burger will run you $5.29 while high-end seasonal joint Park Avenue will sell you its copy of an In-and-Out burger for $23. They're both good, but you're paying more for the latter place's image and ambiance.) The cost to consumers of the plant-based Impossible Meat should be fairly low once it's more widely available -- especially compared to previous attempts at lab-developed meat, which cost as much as $325,000 a patty and didn't even taste very good. For now New York is the only place you can buy an Impossible Burger, with a location in San Francisco to be announced soon. And due to limited quantities and high demand (some customers have asked for 10 to go), each diner is only allowed one burger. Let's hope that changes soon, because the first thing I wanted to do when I finished mine was to eat another one.